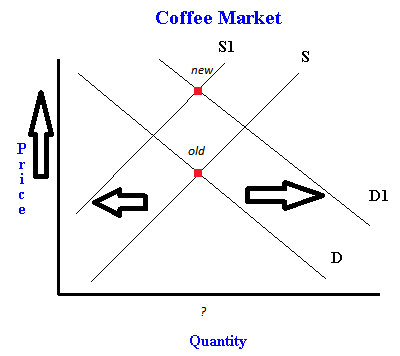 Shifts in supply and demand, an example using the coffee market - FreeEconHelp.com, Learning Economics... Solved! These are all common questions you we see asking about possible shifts in supply and demand and there subsequent effect on equilibrium market price and quantity. Please check out the posts on supply shifts and demand shifters for a brief review. First, if a blight kills off coffee plants then we will see a decrease in supply. This happens because productivity goes down (because the plants are GONE). Nothing happens to demand, so equilibrium price and quantity both go up. If coffee workers organize themselves into a union and gain higher wages, two possible things can happen. First, the price of inputs will go up, so supply will shift left (a decrease in supply). Second, it is possible that higher wages will result in an increase in income which will increase demand (shift it right). However, occasionally teachers are only looking for this first effect. In this scenario, if only the price of inputs rises, we will have the same equilibrium market outcome as the blight. But if income also rises, then we know price will go up, but we don’t know if quantity will increase, decrease, or stay the same without more information. If coffee is shown to cause cancer in rats, then people will be less likely to by it because they may fear that they themselves will get cancer. This results in a change in consumer tastes and preferences in a negative manner that decreases demand (shifts it left). 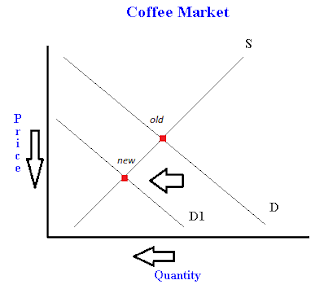 A decrease in demand will lower both equilibrium price and quantity. 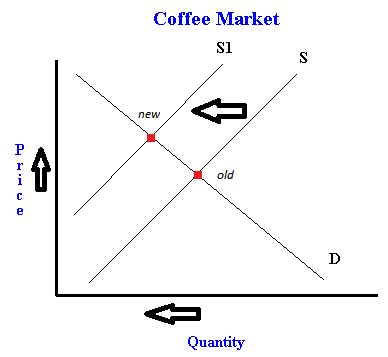 If the price of tea declines, then the price of a substitute for coffee has gone down (if you agree that coffee and tea are substitutes). Since tea is now cheaper, more people will buy tea, and less will buy coffee. This results in a decrease in demand for coffee. The market results are identical to the cancer in rats example. Finally, if coffee prices are expected to rise in the near future then we will see an increase in demand (because people want to buy now before the price hike) and a decrease in supply (because firms want to hold onto it and sell it later at a higher price). This results in a rightward shift of the demand curve, and a leftward shift on the supply curve. The market results here are identical to the union pay increase example above. Writing cause and effect essay is not that easy how it may look like, but you should try it. quantity of tea to ? Explain how the demand for tea will be affected.When the price of coffee decreases and when people become richer while all other factors remain the same.